Brea, California, May 14, 2018—To better serve the needs of OEMs and machine builders, Moxa has launched a new Remote Connect Suite that provides an easier and more secure way to connect to remote machines and equipment for the performance of critical troubleshooting, maintenance, data acquisition, and device management, resulting in faster and smarter support. 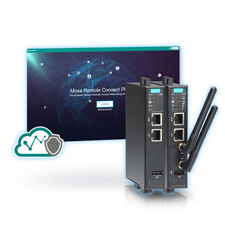 Designed for Industrial IoT environments, the Moxa Remote Connect (MRC) is a remote connection management platform that includes server and client software along with a hardware gateway to seamlessly bridge the gap between field devices, engineers, and application servers for greater visability and support. Hosted on Amazon EC2, MRC connects Ethernet-based edge devices to the server portal with the security needed in today's networks. Client software connects the engineer's laptop to the server portal so that they can manage all devices in realtime through a HTTPS web console. "With an easy to use design, secure connections, and flexible connectivity, the Moxa Remote Connect allows OEMs to access their remote machines effortlessly and streamline their maintenance efforts" stated Li Peng, a product manager in Moxa's Industrial Ethernet Infrastructure business unit. The MRC Auto Configuration function makes installation "plug-and-play" simple with no need for extensive IT knowledge and no requirement to configure VPNs, perform complex firewall settings or reconfigure IP Addresses. MRC provides Smart IP Mapping to avoid IP conflicts and is firewall friendly to comply with existing IT security policies, allowing companies that need secure remote access to minimize the amount of time and effort spent on deployment. In order to combat the numerous security risks that present themselves when data is collected through the Internet, MRC is equipped with security features including end-to-end encryption to prevent man-in-the-middle attacks. The Smart Protection function includes an embedded firewall that permits remote access under whitelist control without disrupting local networks. In order to provide an on-demand maintenance service, access to machines is fully controlled by machine operators. MRC delivers greater flexibility by supporting a variety of connections including 1-to-1, multiple-to-multiple, and site-to-site. It empowers companies to remotely manage numerous machines and users at different locations, which makes it an ideal solution as businesses scale to satisfy growing demand. To learn more about the Moxa Remote Connect secure remote access solution, click here. The MOXA logo is a registered trademark of Moxa Inc. All other trademarks mentioned in this document are the property of their respective owners.